Family deriving its name from the Spanish city of Huesca (the ancient Osca; Hebr. ), where it originated, its members emigrating thence to Portugal, and finally to Italy, to escape the Inquisition. Italian printer; born at Lisbon, where he was known as Duarte Pinel; son of Solomon Usque. Some time after 1543 he went to Ferrara, where he termed himself "Abraham Usque," and established a large printery, adopting as his imprint a globe with Isa. xl. 31 as the legend. 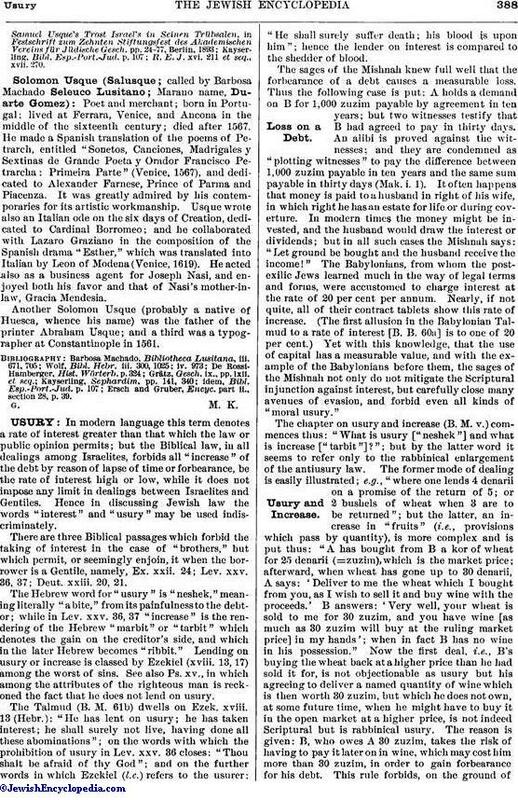 His establishment published some Judæo-Spanish rituals and Portuguese works, and between 1551 and 1557 it issued about twenty-eight Hebrew books, including an unpointed Hebrew Bible, all of these works being edited by Samuel Ẓarfati, Isaac alḤakim, Menahem b. Moses Israel, and Baruch Uzziel. Usque's principal work was the valuable Ferrara Bible, bearing the title "Biblia en Lengua Española Traducida Palabra por Palabra de la Verdad Hebrayca por Muy Excelentes Letrados, Vista y Examinada por el Oficio de la Inquisicion. Con Privilegio del Ylustrissimo Señor Duque de Ferrara." 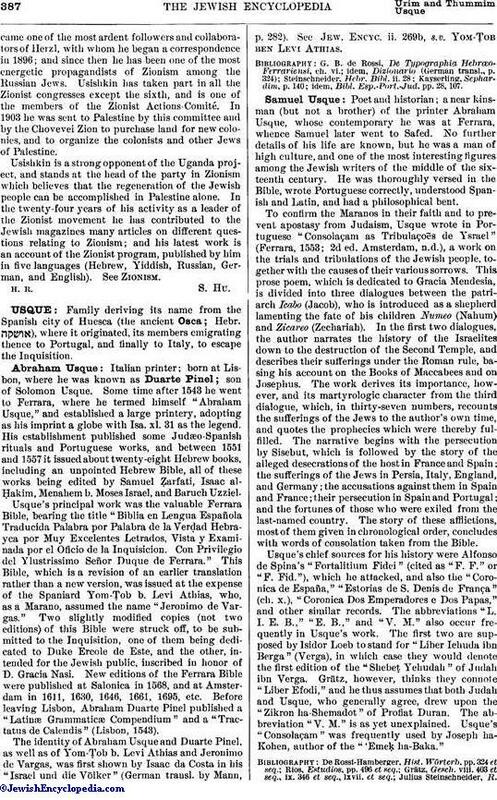 This Bible, which is a revision of an earlier translation rather than a new version, was issued at the expense of the Spaniard Yom-Ṭob b. Levi Athias, who, as a Marano, assumed the name "Jeronimo de Vargas." Two slightly modified copies (not two editions) of this Bible were struck off, to be submitted to the Inquisition, one of them being dedicated to Duke Ercole de Este, and the other, intended for the Jewish public, inscribed in honor of D. Gracia Nasi. New editions of the Ferrara Bible were published at Salonica in 1568, and at Amsterdam in 1611, 1630, 1646, 1661, 1695, etc. Before leaving Lisbon, Abraham Duarte Pinel published a "Latinæ Grammaticæ Compendium" and a "Tractatus de Calendis" (Lisbon, 1543). The identity of Abraham Usque and Duarte Pinel, as well as of Yom-Ṭob b. Levi Athias and Jeronimo de Vargas, was first shown by Isaac da Costa in his "Israel und die Völker" (German transl. by Mann, p. 282). See Jew. Encyc. ii. 269b, s.v. Yom-Ṭob ben Levi Athias. idem, Bibl. Esp.-Port.-Jud. pp. 28, 107. Poet and historian; a near kinsman (but not a brother) of the printer Abraham Usque, whose contemporary he was at Ferrara, whence Samuel later went to Safed. No further details of his life are known, but he was a man of high culture, and one of the most interesting figures among the Jewish writers of the middle of the sixteenth century. He was thoroughly versed in the Bible, wrote Portuguese correctly, understood Spanish and Latin, and had a philosophical bent. To confirm the Maranos in their faith and to prevent apostasy from Judaism, Usque wrote in Portuguese "Consolaçam as Tribulaçoẽs de Ysrael" (Ferrara, 1553; 2d ed. Amsterdam, n.d.), a work on the trials and tribulations of the Jewish people, together with the causes of their various sorrows. This prose poem, which is dedicated to Gracia Mendesia, is divided into three dialogues between the patriarch Icabo (Jacob), who is introduced as a shepherd lamenting the fate of his children Numeo (Nahum) and Zicareo (Zechariah). In the first two dialogues, the author narrates the history of the Israelites down to the destruction of the Second Temple, and describes their sufferings under the Roman rule, basing his account on the Books of Maccabees and on Josephus. The work derives its importance, however, and its martyrologic character from the third dialogue, which, in thirty-seven numbers, recounts the sufferings of the Jews to the author's own time, and quotes the prophecies which were thereby fulfilled. The narrative begins with the persecution by Sisebut, which is followed by the story of the alleged desecrations of the host in France and Spain; the sufferings of the Jews in Persia, Italy, England, and Germany; the accusations against them in Spain and France; their persecution in Spain and Portugal; and the fortunes of those who were exiled from the last-named country. The story of these afflictions, most of them given in chronological order, concludes with words of consolation taken from the Bible. Usque's chief sources for his history were Alfonso de Spina's "Fortalitium Fidei" (cited as "F. F." or "F. Fid. "), which he attacked, and also the "Coronica de España," "Estorias de S. Denis de França" (ch. x. ), "Coronica Dos Emperadores e Dos Papas," and other similar records. The abbreviations "L. I. E. B.," "E. B.," and "V. M." also occur frequently in Usque's work. The first two are supposed by Isidor Loeb to stand for "Liber Iehuda ibn Berga" (Verga), in which case they would denote the first edition of the "Shebeṭ Yehudah" of Judah ibn Verga. Grätz, however, thinks they connote "Liber Efodi," and he thus assumes that both Judah and Usque, who generally agree, drew upon the "Zikron ha-Shemadot" of Profiat Duran. The abbreviation "V. M." is as yet unexplained. Usque's "Consolaçam" was frequently used by Joseph ha-Kohen, author of the "'Emeḳ ha-Baka." R. E. J. xvi. 211 et seq., xvii. 270. Poet and merchant; born in Portugal; lived at Ferrara, Venice, and Ancona in the middle of the sixteenth century; died after 1567. He made a Spanish translation of the poems of Petrarch, entitled "Sonetos, Canciones, Madrigales y Sextinas de Grande Poeta y Orador Francisco Petrarcha: Primeira Parte" (Venice, 1567), and dedicated to Alexander Farnese, Prince of Parma and Piacenza. It was greatly admired by his contemporaries for its artistic workmanship. Usque wrote also an Italian ode on the six days of Creation, dedicated to Cardinal Borromeo; and he collaborated with Lazaro Graziano in the composition of the Spanish drama "Esther," which was translated into Italian by Leon of Modena (Venice, 1619). He acted also as a business agent for Joseph Nasi, and enjoyed both his favor and that of Nasi's mother-in-law, Gracia Mendesia. Another Solomon Usque (probably a native of Huesca, whence his name) was the father of the printer Abraham Usque; and a third was a typographer at Constantinople in 1561. Ersch and Gruber, Encyc. part ii., section 28, p. 39.